Sturdy and reliable, these need no building structure supports. Through a permanent concrete foundation to anchor the crane and function as a counterweight for loads, maximum capacities rely only on the foundation size, span length and I-beam size. A second-pour reinforced foundation supports the sleeve, and offers great advantages: a full 360 degree rotation, full use of floor area below the crane, and relocation of the crane without damage to the mast. Use where space and layouts require flexibility. A lower cost jib crane that offers 360 degrees of rotation without the need for a mounting foundation (which can sometimes cost more than the crane). Crane mounts to the building floor at the bottom and to an overhead steel building support at the top. When support girders and other obstructions get in the way, a drop cantilever jib crane allows mast installation at uppermost anchor points of a building with boom installed at a height needed for full rotation of the boom arm. Permanent mount that is strong and stable. An excellent choice for the highest potential underboom clearance. Can install close to ceilings for more underboom height with a 200 degree rotation. 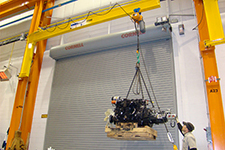 Transmits less direct force to building supports than a tie rod jib crane. Welded or bolted shipping option. There is no support mast under the boom, so you can maximize space usage under the boom right up to the support structure and within a 200 degree rotation area. Cost effective choice if there's plenty of overhead clearance and support column strength. 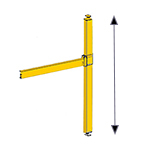 Span is the length of the boom from the midpoint of the mast, or mid-point of the wall bracket, to the end of the boom. The span of your crane should match or exceed the total distance out from the mast that materials will be lifted from (allowing for trolley and hoist mechanism length). Working span, or clear span, is the unobstructed length of the boom along which the trolley can move, and it is always less than the overall span. It is approximately the distance from the vertical support member to the end of the boom, though it may be slightly limited by other design features. 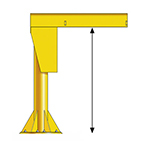 Rotation is determined by the type of jib crane selected; free standing and mast type jib cranes offer 360 degrees of rotation while wall mounted cranes provide 200 degrees of rotation. 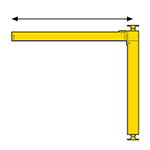 Capacity rating of jib crane must exceed maximum weight of materials to be handled and is based on the design load which includes allowance for the hoist and trolley weights plus impact load and deflection compensation. Underboom height is the distance from the floor to the underside of the boom. 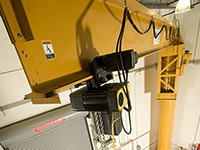 The height of the hoist will reduce the vertical clearance usable for lifting loads. 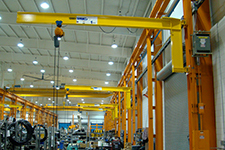 Overall height is the highest point of the crane after installation and should fit within the available headroom that is free of obstructions in order for the boom to move freely. Power motor considerations include how much power is needed, which components need	power (jib rotation, trolley, hoist or all three), how and where the power will be supplied, and whether system will be used indoors or out.